After much anticipation the autumn season is officially here, and I am loving it! Its only been this year that I’ve finally realised that Autumn is definitely my favourite season as I love all of the activities and the fashion. With colder days comes cool-weather fashion, and who doesn’t love cuddling up in a big, cosy cable-knit jumper every now and then? I know I do! Although it’s tempting to live in soft sweaters forever, sometimes you’ve got to mix things up (especially when you’re going out), and that’s when this year’s fall trends come in handy. If you’re not sure how to look stylish, you can easily pick up one of the trending looks seen on fashion websites to give you some inspiration. This season, there are plenty of fun fall fashion fads to give a try. Even if you don’t consider yourself a risk-taker, you can easily transform these popular styles to fit in with a classic or “safe” wardrobe. It’s all about how you choose to style the garment, and of course, choosing one that fits nicely with your personal sense of style. Ready to see which are my favourite fall trends? There’s no denying that we have seen a lot of influence coming from earlier decades over the last year. One of the best products of the ’70s fashion influence has been the resurgence of thick-heeled footwear. More specifically, thick heels on ankle boots. These styles have a very retro vibe, but the heel is a fun silhouette to add to an outfit, plus they’re easier and more comfortable to walk in than a stiletto! Pretty much every runway photo on Fashionisers is showing a thick-heeled shoe, so you’ve got plenty of ideas to work with! It seems that skinny jeans are getting the nudge. Now, all you’ll see on the fashionistas is a much wider shape. While I’m not ready to get rid of my skinnies just yet, I’m ready to embrace the wide leg trend as these trousers are so big right now. There are lots of variations on the new silhouette that will make it easy to incorporate the look into your fall wardrobe. You can choose from culotte styles or jeans that simply don’t taper at the ankle. Depending on how daring you are, you can pick up a pair of dramatic flares to really elevate your fashion status! Arguably THE fabric of the season, velvet is no longer reserved just for luxe looks. This rich texture is a must for autumn, and the good news is that you can find it on just about anything. You can wear velvet shoes, a velvet jumper, or check out these velvet pants from Armani on Lyst. I even saw a velvet bomber jacket online yesterday! No matter how to choose to flaunt the fabric, it will surely make you look like a rockstar. This is a very fun trend that everyone should give a try! Lastly, florals are really trending for fall. I know it seems weird to wear the pattern when it’s not spring or summer, but trust me—fall florals are fabulous. The key is to keep the colours close to an autumnal palette. Don’t pick up any pastels. Instead, reach for burnt and gem-tone colours contrasted on a dark background. According to Regard Mag, florals become a little more moody in the fall, and they look great mixed with metallic. I’ve been updating my wardrobe so much over the last couple of weeks and I’m so happy with the autumnal additions that I’ve made including some gorgeous wide leg trousers and a velvet off the shoulder top which I’ll be wearing with leather trousers for a Christmas night out! I’m also loving over the knee boots and bardot jumper dresses right now which will be featuring in an upcoming fashion post… stay tuned for now! What are your favourite autumn fashion trends right now? I love velvet in Autumn, very underrated so thanks for making me more confident about wearing it now the weather is getting colder. Honestly? I enjoy going through second hand stores/charity shops looking for oversized jumpers. I just love wearing my skinnies with flat boots and an oversize jumper. My fave combo. In love the look of the autumn florals I'm a fan of floral anyway but more so in autumn. What some gorgeous looking piece, those floral boots are amazing! So different to anything I have seen before. I love all the trends this season! And I feel like there are so many! 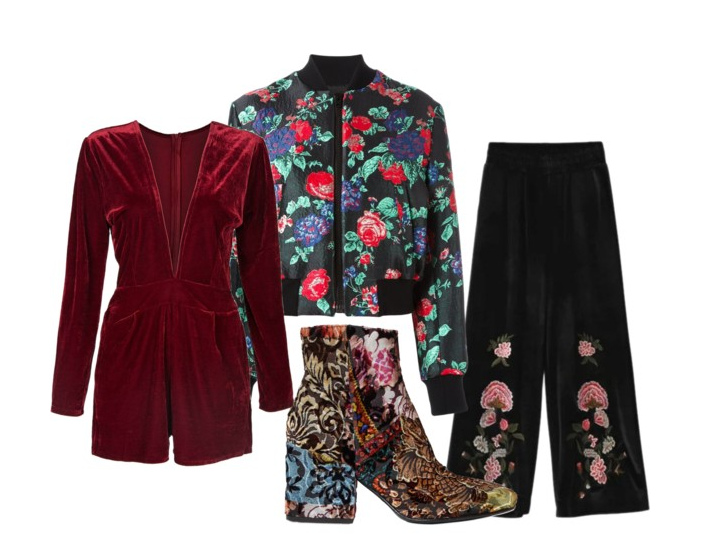 It's justa beautiful mixture of amazing things :), I already joined the velvet one, last year got myself a pair of 70,s boots and now looking for a floral embroidered item! What a great selection of colourful products for Autumn wear. The top is the perfect colour for the season. Laura! That jacket is gorgeous! I love it! I'm so loving velvet, it is just the time of year for it. Beautiful! Velvet is the trend I'm loving. That playsuit looks amazing! I love Autumn for the colours of the trees and I absolutely love those 70s boots!